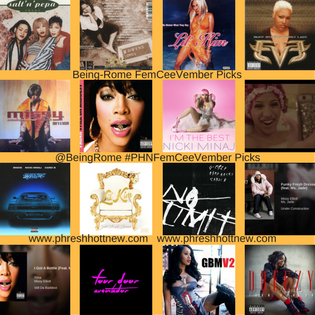 BeingRome FemCeeVember Picks ~ Phresh Hott New! I had so much fun collaborating on Phresh Hott New’s annual November Female MC’s playlist that I thought about doing one of my own. I didn’t want to add a lot of songs, so originally it was just going to be a Top 10. I found out when I started that picking 10 songs would be a lot harder than I thought it would be, lol. It went from there to 15 songs, and let’s just say I went a little over that as well, lol. I had so many songs that I did like it was hard to choose, but not to worry I kept it under 20 songs. I picked some current songs, to mix in with some older songs I like. Some of the selections weren’t singles from the artists. None the less they really stood out and should have been actual singles…in my opinion at least. I put the playlist in the order I thought it would flow best. So, you can listen to it that way, or shuffle mode if you prefer. Without any further ado click play, sit back relax, and enjoy the playlist. Oh yea, I would love to hear what you think of the playlist, and some of your favorite Female MC’s songs. Also, don’t forget to check out PHNFemCeeVember Music Playlist for even more hits.